You need acrylic paints, ribbon and tea light. Paint the jar at any color that you like. After painting the background of the jar, with white color paint the snowman, and paint its further particulars like eyes, nostril, scarf, buttons, and everything else that you want, you can even use some glitter. 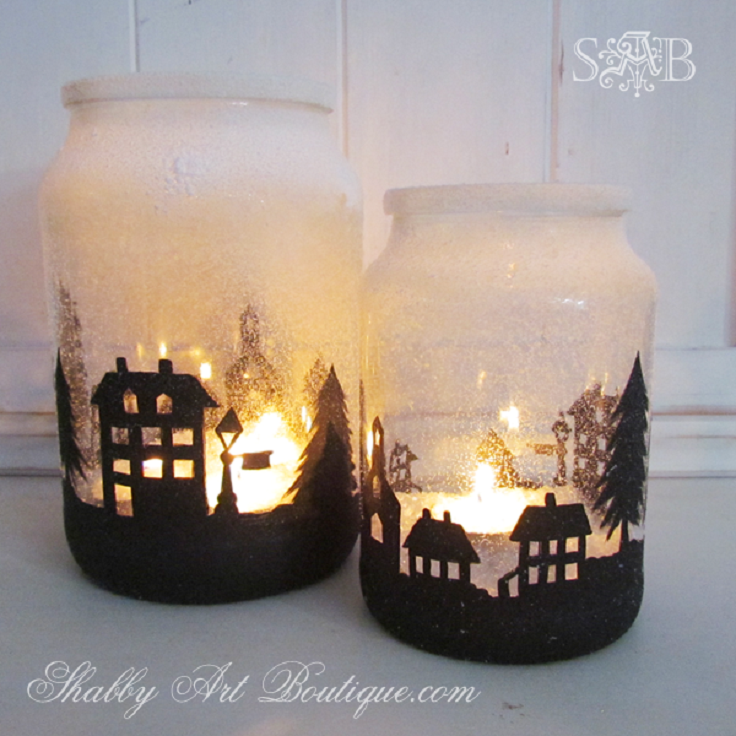 After you are done with painting tie a ribbon around the jar and put a tea light inside. 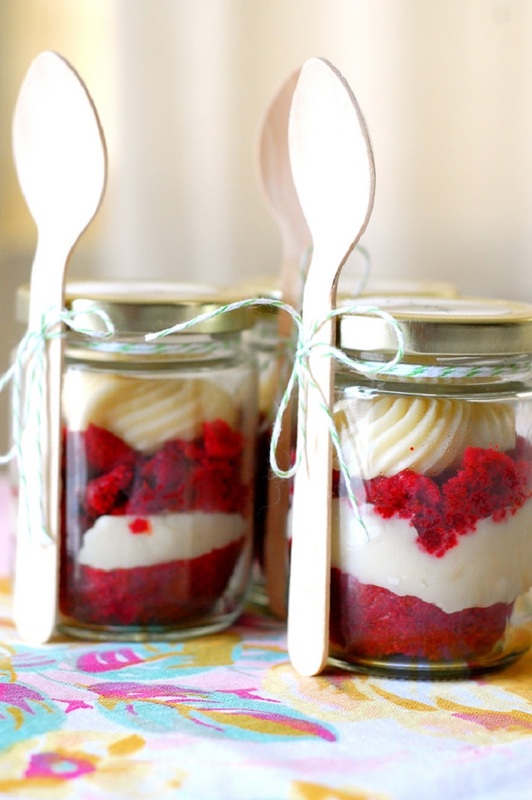 This cupcake jar is very simple and tasty. You need red cupcakes and some frosting. You first put one cupcake, and than some frosting, after that you just repeated, but not with a whole cupcake. 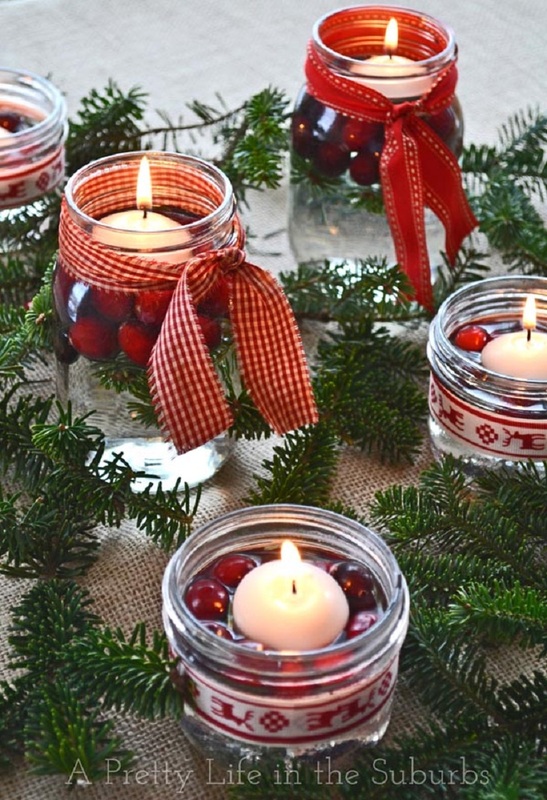 For this Christmas jar decoration, you need a floating candle, fresh cranberries, and a ribbon. This decoration is very simple. Add some cranberries and spring of evergreen, after that wrap some ribbon around the jar. Fill the jar with water, almost to the top. And than just put the floating candle inside. This is very simple decoration, and you have many options for it. You can use any material that you want, or not use anymore. You can use lace, material from sweater, material from scarf, the list is big. Than you can just glue the material on the jar or sew the material. And you can put some extra decoration. The decoration of this jar is presenting a small town. For this decoration you need acrylic paint-black, snow spray. First measure the jar, and than draw the town on paper with these dimensions. Put the drawing inside of the jar. With a brush paint the outside with the acrylic paint. Let the jar dry, and than paint the second coat, and again let it dry. After is completely dry, spray the jar with the snow spray. You need some lace, hot glue, snow-tex, twine, pine cones, epson salt. 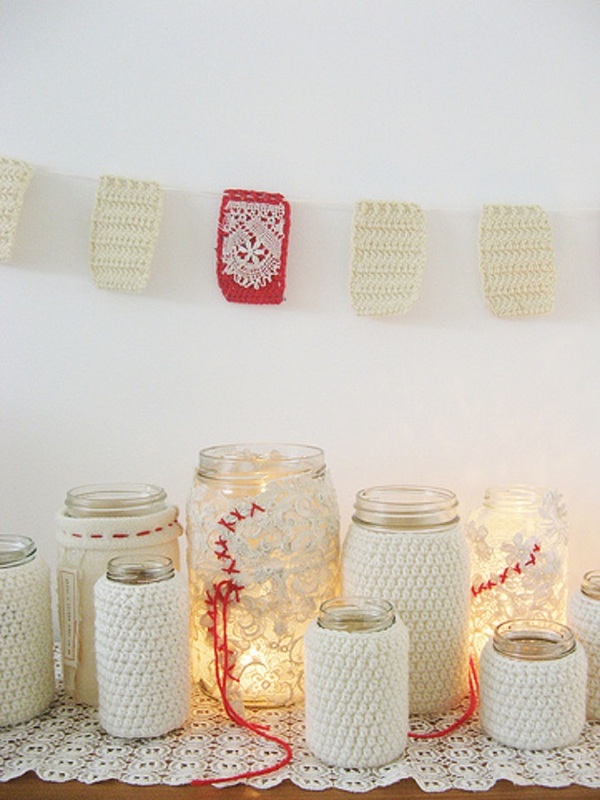 First you need to glue the lace at the top of the jar. Then you tie the twine around the top. The pine cones you can glue them the to the twine or to the lace, whatever is easier for you. After that you put epson salt inside of the jar, an than the candle. 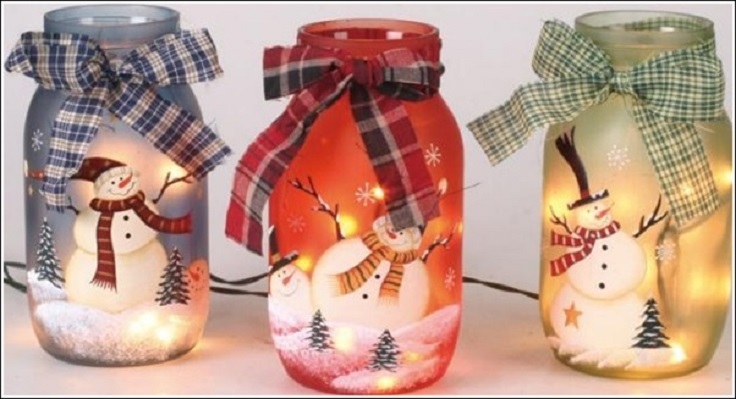 Use the snow-tex at the top of the jar and put same at the pines cones, to get the snow effect. 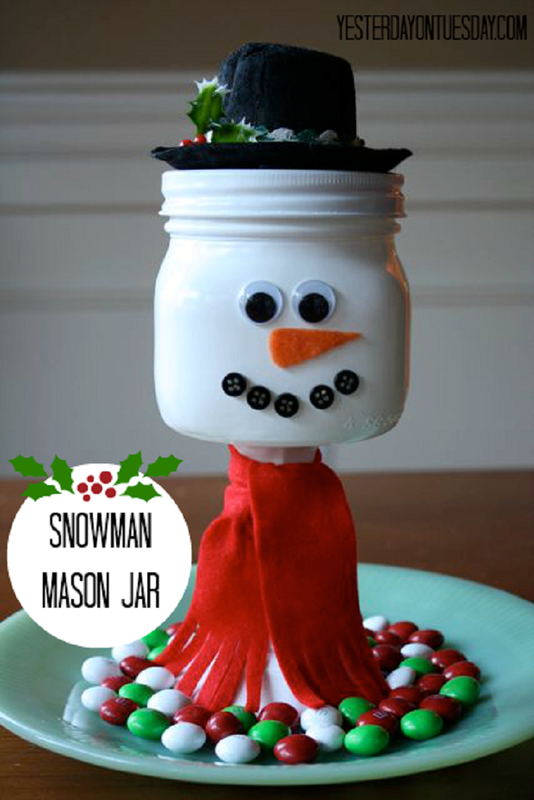 Elf mason jar is very fun for a gift for children. It is simple. 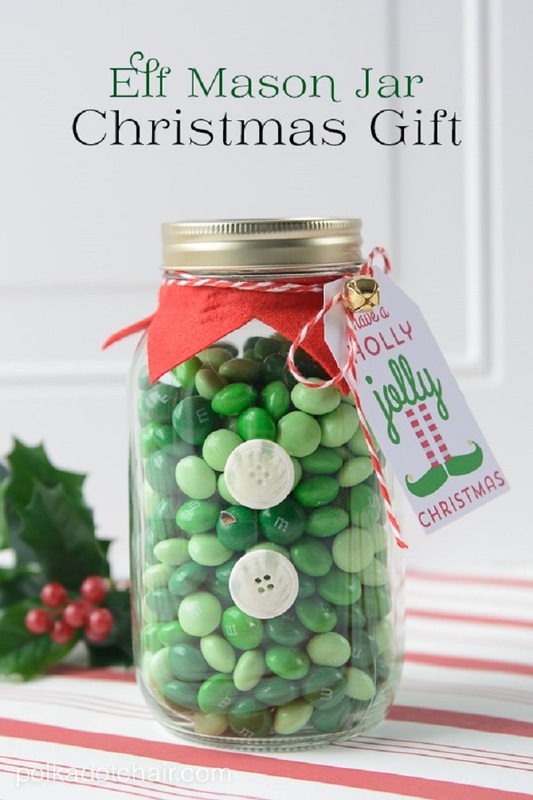 You fill the jar with green m&m candy. Glue two white bottoms on the jar, and at the top decorated with red material. 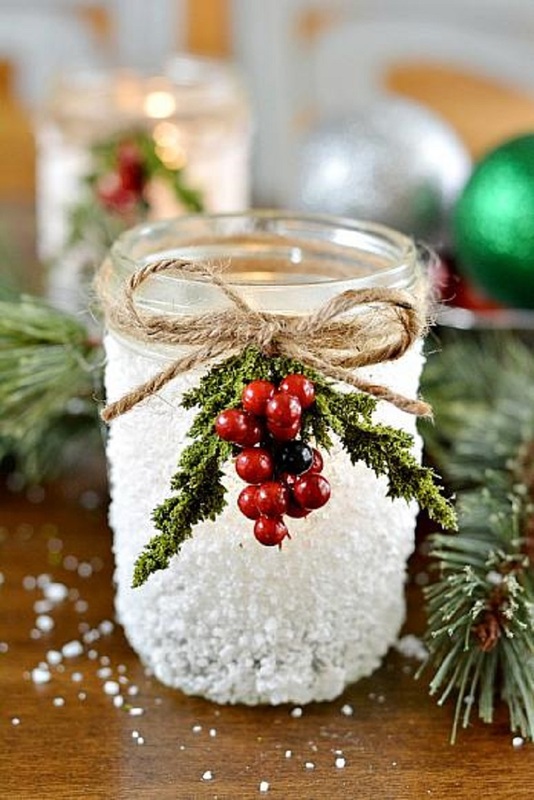 For this jar decoration you will need decoy-page glue, epsom salt, twine, christmas picks. First you put the glue all over the mason jar. While the glue is still wet put the epsom salt all over the jar. The salt will make the jar like it’s covered with snow. Tie the twine around the top of the jar and hot glue mixed berries and picks, or something else that you prefer for decoration. This decoration is very fun. You need spray paint-glossy white, glass candlestick holder, glue, small black hat, orange felt. googly eyes, black bottoms and hot glue. Spray paint the jar and the glass holder, spray them three times. After that glue the jar and the glass holder together. Use the hot glue to glue the eyes, the bottoms, and a small triangle from the orange felt as a nose. Glue the hat at the top of the jar, and then cut some material for the scarf and tied around. For this great decoration you will need, gold foil spray paint, mod podge, extra fine gold glitter, burlap string, gold string, and blue painters tape. Spray the jar with the gold spray, about five time letting it dry between each coat. Once your gold mason jar is totally dry, place blue painters tape around the bottom of the jar. Next, brush on mod podge all the way around the jar. Than sprinkle glitter around the jar where there is glue. than take out the blue tape. 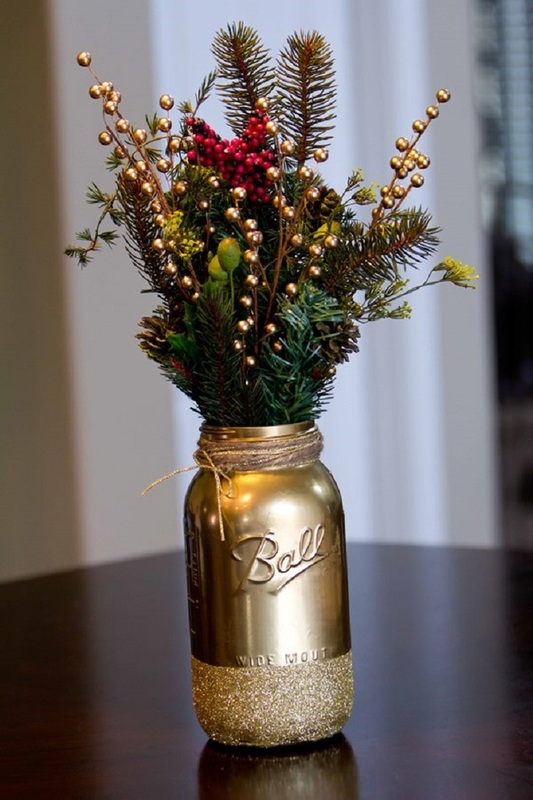 Take the burlap string and gold string and wrap it around the top of the jar, and tie a bow. 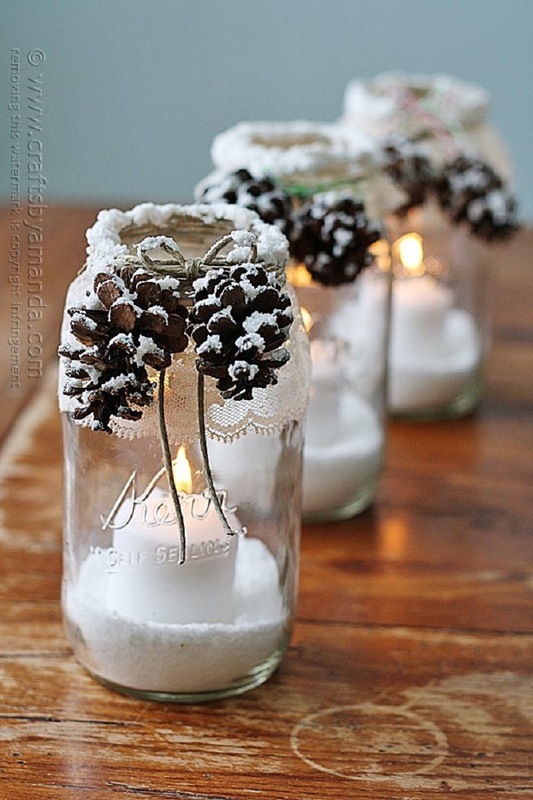 At the end grab some holiday floral that you like and put it in the jar.